DICKINSON, SUSANNA WILKERSON (ca. 1814–1883). Susanna Wilkerson Dickinson (also spelled Dickerson), survivor of the Alamo, was born about 1814 in Tennessee, perhaps in Williamson County. Her first name has also been recorded as Susan, Susana, and Suzanna; her maiden name is sometimes given as Wilkinson. On May 24, 1829, she married Almeron Dickinson before a justice of the peace in Bolivar, Hardeman County, Tennessee. The couple remained in the vicinity through the end of 1830. The Dickinsons arrived at Gonzales, Texas, on February 20, 1831, in company with fifty-four other settlers, after a trip by schooner from New Orleans. On May 5 Dickinson received a league of land from Green DeWitt, on the San Marcos River in what became Caldwell County. He received ten more lots in and around Gonzales in 1833 and 1834. The Dickinsons lived on a lot just above the town on the San Marcos River, where Susanna took in at least one boarder. A map of Gonzales in 1836 shows a Dickinson and Kimble hat factory in Gonzales. Susanna's only child, Angelina Elizabeth Dickinson, was born on December 14, 1834. Susanna and her daughter may have joined other families hiding in the timber along the Guadalupe River in early October 1835, when Mexican troops from San Antonio demanded the return of an old cannon lent to Gonzales four years earlier. The resulting skirmish, the battle of Gonzales, was the first fight of the Texas Revolution. Susanna said goodbye to her husband on October 13 as the volunteers left for San Antonio under command of Stephen F. Austin. She remained in Gonzales through November, when newly arriving troops looted her home. She joined Dickinson in San Antonio, probably in December 1835, and lodged in Ramón Músquiz's home, where she opened her table to boarders (among them David Crockett) and did laundry. On February 23, 1836, the family moved into the Alamo. After the battle of the Alamo on March 6, Mexican soldiers found her—some accounts say in the powder magazine, others in the church—and took her and Angelina, along with the other women and children, to Músquiz's home. The women were later interviewed by Santa Anna, who gave each a blanket and two dollars in silver before releasing them. Legend says Susanna displayed her husband's Masonic apron to a Mexican general in a plea for help and that Santa Anna offered to take Angelina to Mexico. Santa Anna sent Susanna and her daughter, accompanied by Juan N. Almonte's servant Ben, to Sam Houston with a letter of warning dated March 7. On the way, the pair met Joe, William B. Travis's slave, who had been freed by Santa Anna. The party was discovered by Erastus (Deaf) Smith and Henry Wax Karnes. Smith guided them to Houston in Gonzales, where they arrived after dark about March 12. Susanna Dickinson probably followed the army eastward in company with the other Gonzales women. Illiterate, without family, and only twenty-two years old, she petitioned the government meeting at Columbia in October 1836 for a donation, but the proposed $500 was not awarded. She needed a male protector, and by June 1837 she was cohabiting with John Williams, whom she married about November 27, 1837. He beat her and Angelina, and she petitioned in Harrisburg (later Harris) County for a divorce, which was granted on March 24, 1838—one of the first divorces in the county. By 1839 Almeron Dickinson's heirs had received rights to 2,560 acres for his military service; they sold the land when Angelina reached twenty-one. Subsequent requests to the state legislature in November 1849 were turned down. Susanna tried matrimony three more times before settling into a stable relationship. She wed Francis P. Herring on December 20, 1838, in Houston. Herring, formerly from Georgia, had come to Texas after October 20, 1837. He died on September 15, 1843. On December 15, 1847, Susanna married Pennsylvania drayman Peter Bellows (also known as Bellis or Belles) before an Episcopalian minister. In 1850 the couple had sixteen-year-old Angelina living with them. But by 1854 Susanna had left Bellows, who charged her with adultery and prostitution when he filed for divorce in 1857. Susanna may have lived in the Mansion House Hotel of Pamelia Mann, which was known as a brothel, before marrying Bellows. The divorce petition accuses her of taking up residence in a "house of ill fame." Nevertheless, Susanna received praise from the Baptist minister Rufus C. Burleson for her work nursing cholera victims in Houston, where he baptized her in Buffalo Bayou in 1849. Susanna's fifth marriage was long-lasting. She married Joseph William Hannig (or Hannag), a native of Germany living in Lockhart, in 1857. 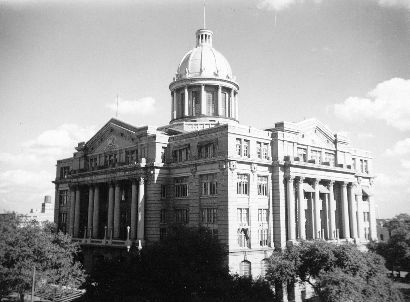 They soon moved to Austin, where Hannig became prosperous with a cabinet shop and later a furniture store and undertaking parlor; he also owned a store in San Antonio. Susanna became ill in February 1883 and died on October 7 of that year. Hannig buried her in Oakwood Cemetery, and even though he married again, he was buried next to Susanna after his death in 1890. C. Richard King, Susanna Dickinson: Messenger of the Alamo (Austin: Shoal Creek, 1976). Handbook of Texas Online, Margaret Swett Henson, "DICKINSON, SUSANNA WILKERSON," accessed April 19, 2019, http://www.tshaonline.org/handbook/online/articles/fdi06.